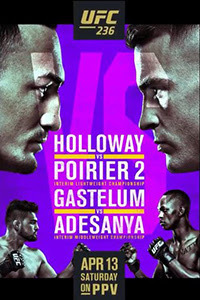 UFC 236: Holloway vs. Poirier 2 took place April 13, 2019 at State Farm Arena in Atlanta, Georgia. • Max Holloway vs. Dustin Poirier 2 (UFC Interim Lightweight Championship): Dustin Poirier def. Max Holloway via unanimous decision (49-46, 49-49, 49-46). • Israel Adesanya vs. Kelvin Gastelum (UFC Interim Middleweight Championship): Israel Adesanya def. Kelvin Gastelum via unanimous decision (48-46, 48-47, 48-46). • Eryk Anders vs. Khalil Rountree: Khalil Rountree def. Eryk Anders via unanimous decision (30-26, 30-26, 30-26). • Nikita Krylov vs. Ovince Saint Preux: Nikita Krylov def. Ovince Saint Preux via submission (rear-naked choke) at 2:30 of Round 2. • Matt Frevola vs. Jalin Turner: Matt Frevola def. Jalin Turner via unanimous decision (30-27, 30-27, 30-27). • Max Griffin vs. Zelim Imadaev: Max Griffin def. Zelim Imadaev via majority decision (29-27, 29-27, 28-28). • Boston Salmon vs. Khalid Taha: Khalid Taha def. Boston Salmon via TKO (punches) at 0:25 of Round 1. • Curtis Millender vs. Belal Muhammad: Belal Muhammad def. Curtis Millender via unanimous decision (29-27, 29-27, 30-26). • Poliana Botelho vs. Lauren Mueller: Poliana Botelho def. Lauren Mueller via unanimous decision (29-28, 29-28, 29-28). • Randy Costa vs. Brandon Davis: Brandon Davis def. Randy Costa via submission (rear-naked choke) at 1:12 of Round 2.